Just want to share my little project . . . still a work in progress but already functional. 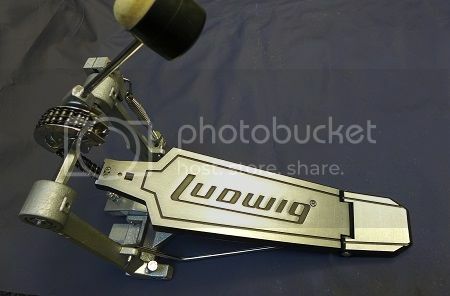 I recently got an old Ludwig Drum Pedal. 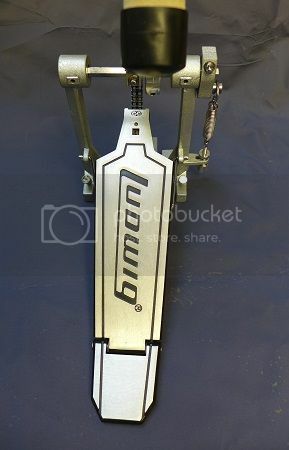 This is just a standard double-chain single bass pedal. 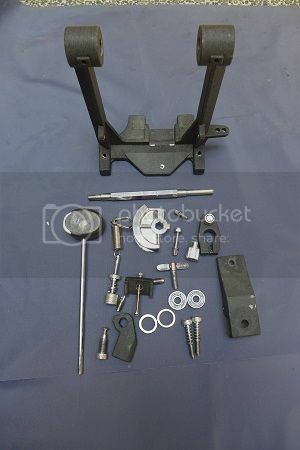 First, I disassembled all the parts. Nung tinanggal ko yung bearing shield . . . its filled with thick grease . . . kaya naman pala malagkit nung iniikot ko. Ayaw nga mag free-spin kahit isang revolution lang. Nilinis ko using kerosene tapos ginamit ko 3 in 1 oil as lubricant. Laki ng difference sa feel. Naging very smooth and was able to free-spin for several revolutions. AFAIK this is the widely used bearing in the skateboarding world. Its cheap and its fast. FWIW mentioning . 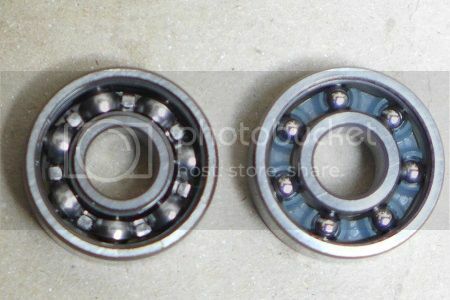 . . this bearing when installed in a skateboard wheel was able to free spin for 4 minutes. So kung smoothness lang din ang pag-uusapan . . . it's smooth more than enough for a drum pedal. The big difference is the bearing ball retainers/cage. - Yung original uses steel-cage retainers while the Reds uses nylon retainers. - Steel retainer is heavier and totally enclosed sa bearing balls therefore more contact equals more friction equals more resistance. 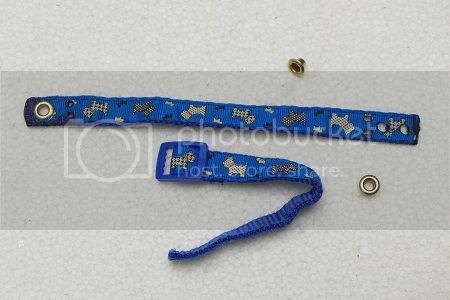 - Nylon retainer is lighter and holds the bearing balls with less contact therefore less friction equals less resistance. CONCLUSION: Mas smooth and fluid ang movement ng Bones Reds compared sa original bearing. Noticeable ang difference nila but do take note that Im using my hand to feel the bearing rotation smoothness. Pero honestly kung paa na ang gagamitin to compare them . . . baka I can hardly tell the difference. 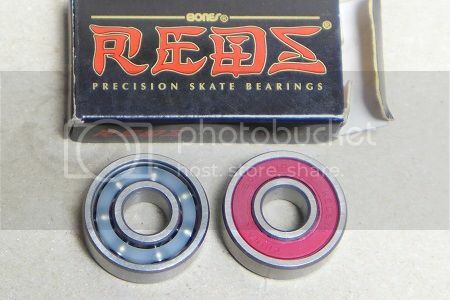 But nevertheless, smoother bearing means less muscle stress in the long run so I'm using the Bones Reds Skateboard Bearings. I assumed pareho lang ang diameter ng mga hex-shaped pedal shaft so I used the Vari-Pitch Beater Holder for TAMA Speed/Iron Cobra Pedals. 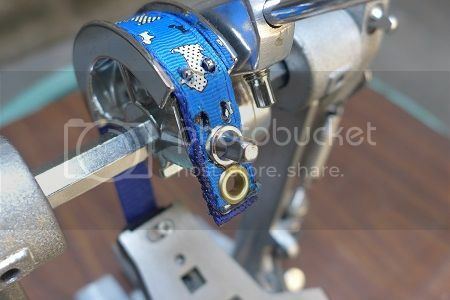 This will give the pedal the ability to adjust the beater angle independent sa footboard angle. 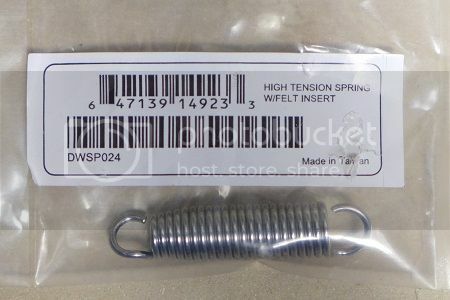 I used the High Tension Pedal Spring for DW9000 pedals. It is equipped with internal noise damper. 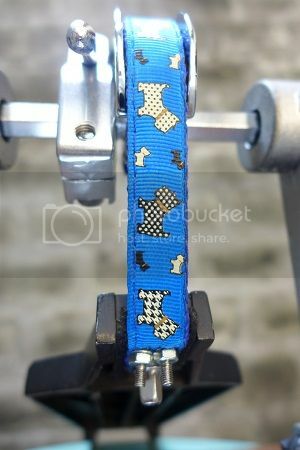 I also made an optional belt drive using dog collar strap. Gamit ko heated nails to make the holes and eventually seal them to prevent stripping. 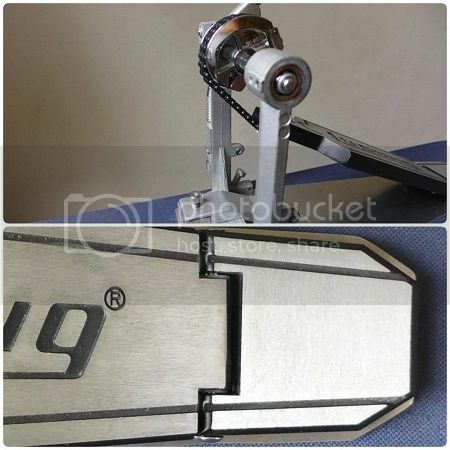 Saktong sakto ang width sa cam sprocket and is resistant to stretching. I also provided an extra hole for optional adjustment sa footboard angle. Then luckily may nahanap akong eyelet for added durability. 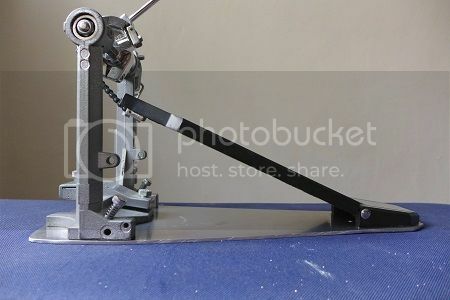 As soon as makakita ako ng material to make the base plate para mas maging stable yung pedal. Then I will install the footboard farther away (about half an inch more), from the cam/beater assembly. This way it will mimic TAMA Speed Cobra's "Recessed Setting" feature. 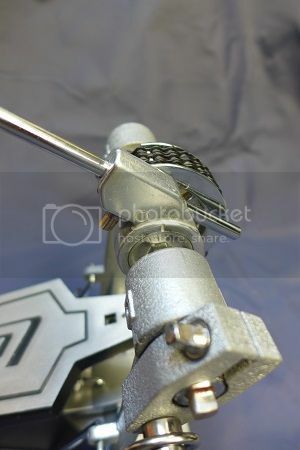 And lastly, I spray painted the pedal frame with silver color for a different look. From being a Standard Single Bass Pedal . . . now equipped with upgraded features. Been using the pedal for the past weeks and still trying to get that sweet-spot adjustment. 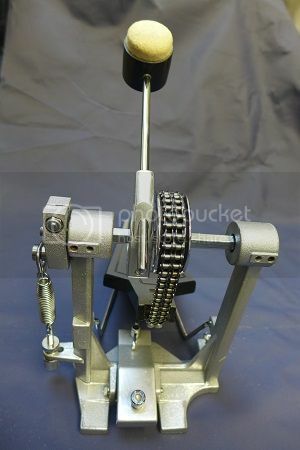 But between the chain drive and strap drive . . . 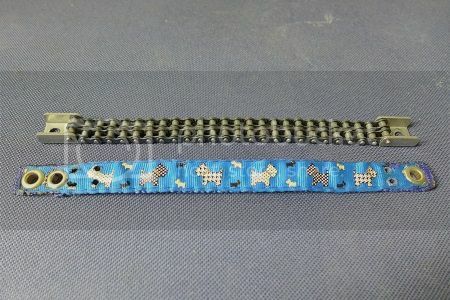 I like the feel of the strap drive better. Mas magaan and less stress sa paa (but that's just me). I wonder what the pedal would feel after installing the Quick Torque Cam and with the Recessed Setting feature (kaya bilhin nyo na items ko . . . hehe). yes sir, naghahanap na ako ng right material. thanks sir, big help . . . pasyalan ko minsan. aluminum is good since it is easy to cut and form, kaya lang you may need to add weight on it for overall stability? 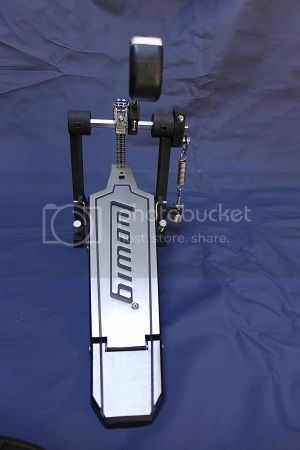 I think the pedal should be bottom heavy overall para stable. ok sir . . . noted. Thanks for the input. 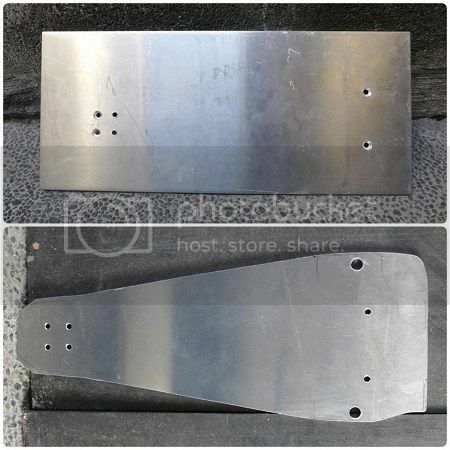 I already got the material for the base plate. Thanks to sir peeves24 for pointing me where to get them. 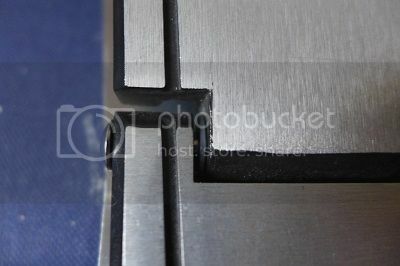 It's a 1/8" thick T6 aluminum. Mas mabigat compare sa ordinary aluminum plate. Drilled all the necessary holes then cut to shape. 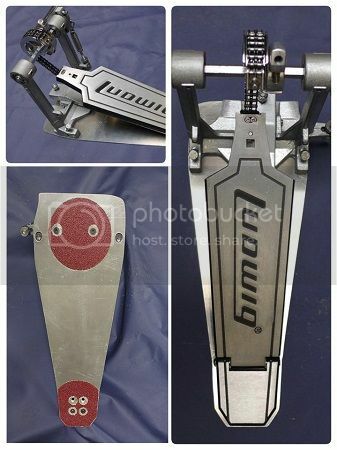 Mounting the pedal to the plate. Instead of using rubber footing . . . I used a 60 grit sanding disc to provide that "ultra grip." 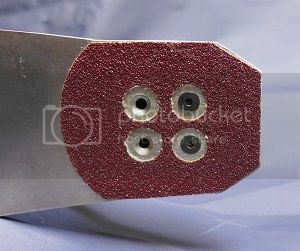 The heel plate can be mounted in two positions . . . ala "powershifter"
Normal Setting . 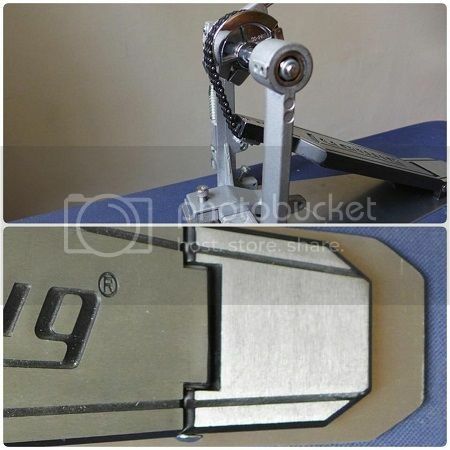 . .
Saan at magkano po ang score nyo sa iron beater holder? Pati pala yung bearing? same size lang din kaya ng bearing ng gibraltar? im sure pareho lang din yan sir. 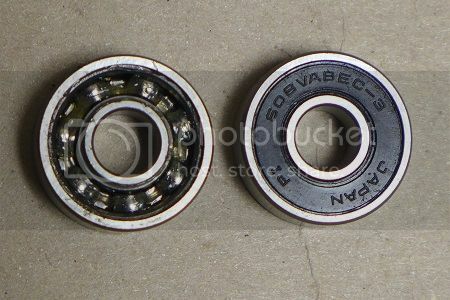 TIP 1: Once the bearing is removed and replaced . . . (kahit ibalik ulit ung original bearing) . . . you might notice may konting play na yung hex shaft. 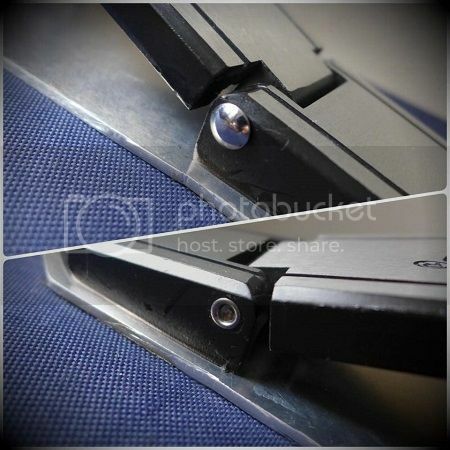 Before mounting back the bearing, insert a small piece of cloth (felt cloth is best), thick paper or a thin cardboard para "snug-fit" ang bearing. TIP 2: Skateboard bearings require a "break-in" period. Put the bearing in an old drumstick and just let it spin. Ang ginawa ko pinalaro ko sa bata for three days (no oil required). After that ang bilis nang umikot ng bearing . . . only then nilagyan ko ng konting konting singer oil. One drop is more than enough para lang matanggal yung "hissing" sound pag umiikot yung bearing. Never user grease or thick oils . . . (motor oil or the likes) . . . masyadong malapot, it's dust and dirt magnet and eventually will be turned into "gunk" and will make the pedal sloppy. Magkano kuha mo sa alloy plate sir? Php 278.00 for a 15" x 7"
nakakaexcite yung project mo bro! sobrang transformation! oo nga sir . . .
but wait . . . there's more !!! 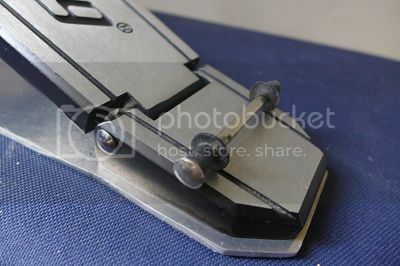 Naisip ko I-modify na din yung footboard-heel plate hinge. Ang lakas kasi ng side-to-side motion at ang lakas ng garalgal. Yung plastic bushing nya manipis na and most probably malambot na. 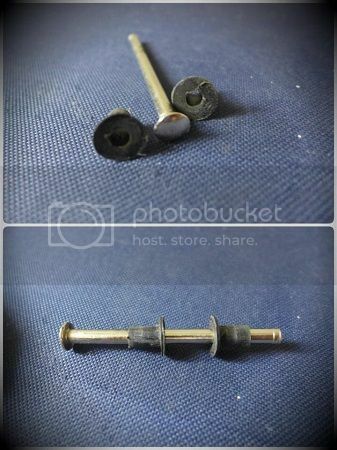 Mabuti na lang nakakita ako ng exact same hinge assembly galing sa isang stock “generic” pedal. 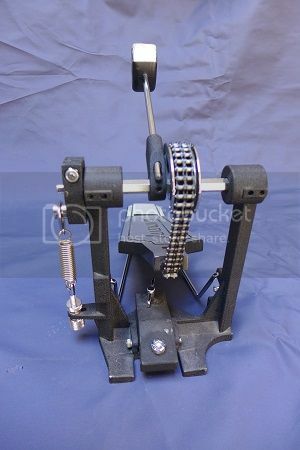 At least may idea na ako kung ano ang diameter ng rod pati dimension ng plastic bushing bago ko pa tanggalin yung actual hinge ng pedal ko. 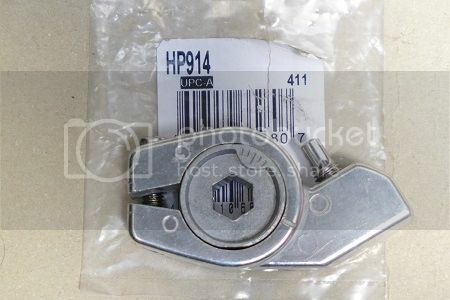 And I just found the perfect replacement for the bushing. 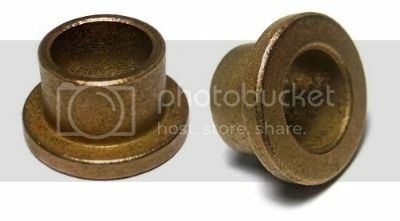 It's an Oilite Bronze Flanged Bushing. This bushing is impregnated with oil therefore it is self lubricating and highly resistant to wear and corrosion. Got it from Ebay selling for $2.75 /piece. If my measurements are correct . . . this would be a perfect fit. In a week or two dadating na yung bushing at magkaka-alaman na kung effective nga. Either this will be a success or a lesson learned. pwede bang mag eb at itest drive natin tio sir! 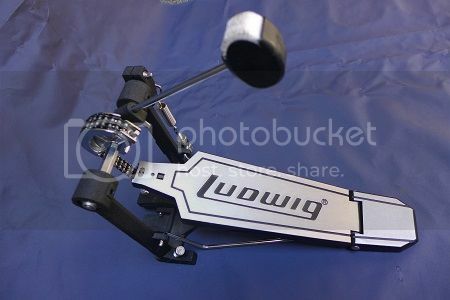 gusto ko rin malaman how this pedal would stand-up on the foot of a seasoned drummer. Frankly speaking, all this pedal does at the moment is a . . .
"thug - pak - thug thug - pak" beat! !